The U.S. Census Bureau keeps track of geographic boundaries for tabulation purposes. In addition to political boundaries such as states and counties, the Census Bureau also creates smaller levels of geography so that data can be tabulated to smaller units. The smallest units are census blocks, followed by block groups and census tracts. The diagram to the right below illustrates the hierarchical relationship of these smaller census summary levels. BelowAlso below are more detailed descriptions for all of the summary levels for which the Census Bureau tabulates data. All of these census summary levels are available for Caliper mapping software products and include 2010 Census data. Caliper also offers 1990 Census data and 2000 Census data. Blocks are the smallest entity for which the Census Bureau collects and tabulates census information. There are about 11 million census blocks nationwide as of the 2010 Census. In cities, a census block is typically equivalent to a city block bounded by streets on all sides. In rural areas, however, a census block may be larger and bounded by streets, streams, railroad tracks, city limits, or county boundaries. 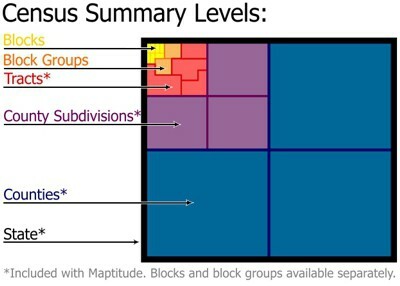 Block groups are a combination of census blocks and are also a subdivision of census tracts. Block groups generally contain between 600 and 3000 people and are made up of on average 40 census blocks. There are about 220,000 block groups nationwide as of the 2010 Census. Tracts are a small, relatively permanent statistical subdivision of a county delineated by a local committee of census data users for the purpose of presenting census data. Census tract boundaries normally follow visible features, but may follow governmental unit boundaries and other non-visible features, and they always nest within counties. Census tracts are designed to be relatively homogenous units with respect to population characteristics, economic status, and living conditions at the time the users established them. They usually contain 1,500 to 8,000 people and are made up of on average about four block groups. There are about 73,800 tracts nationwide as of the 2010 Census. The census tract layer included with Maptitude is ideal for demographic mapping and for estimating the demographics of territories or around sites. County subdivisions are the primary divisions of counties for the reporting of decennial census data. They include minor civil divisions (MCDs are the primary governmental or administrative divisions of a county such as boroughs, towns, and townships), census county divisions (CCDs were established by the Census Bureau in 21 states where there are no legally established MCDs), census subareas, and unorganized territories. Counties are the primary legal divisions of most states. In Louisiana, these divisions are known as "parishes." In Alaska, which has no counties, the statistically equivalent entities are census areas, city and boroughs (Juneau City and Borough), a municipality (Anchorage), and organized boroughs. The entire District of Columbia is considered equivalent to a county for statistical purposes. The primary legal divisions of Puerto Rico are termed "municipios" and are treated by the U.S. Census Bureau, for statistical purposes, as the equivalent of a county in the United States. The County layer included with Maptitude is ideal for demographic mapping of county data. States are the primary governmental divisions of the United States. The District of Columbia is treated as a statistical equivalent of a state for decennial census purposes, as are Puerto Rico and the Island Areas: American Samoa, Guam, the Commonwealth if the Northern Mariana Islands, and the Virgin Islands of the United States. Places include census designated places, consolidated cities, and incorporated places. A Census designated place is a settled concentration of population that are identifiable by name but are not legally incorporated under the laws of the state in which they are located. Consolidated cities are where an incorporated place and its county or minor civil division (MCD) have merged. Incorporated places are those reported to the U.S. Census Bureau as legally in existence on January 1, 2010, under the laws of their respective states, as cities, boroughs, towns, and villages, with the following exceptions: the towns in the New England states, New York, and Wisconsin, and the boroughs in New York are recognized as minor civil divisions for statistical purposes; the boroughs in Alaska are county equivalents for decennial census statistical presentation purposes. In four states (Maryland, Missouri, Nevada, and Virginia), there are one or more incorporated places known as "independent cities" that are primary divisions of a state and legally not part of any county. For statistical purposes, the U.S. Census Bureau may treat an independent city as a county equivalent, county subdivision, and place. Caliper's Core Based Statistical Areas layer contains Metropolitan Statistical Areas. Metropolitan Statistical Areas (MSAs) are geographical relatively high population density geographic regions with close economic ties throughout the area. Caliper's Core Based Micropolitan Statistical Areas layer contains Micropolitan Statistical Areas. Micropolitan Statistical Areas are around urban areas with a population of 10,000 to 49,999. MSAs and Micropolitan Statistical Areas are not legally incorporated nor are they legal administrative divisions. Congressional districts are the 435 areas from which members are elected to the U.S. House of Representatives. State legislative districts are the areas from which members are elected to upper (senate) or lower (house/assembly) chambers of the state legislatures. Voting districts are areas, such as precincts, wards, and election districts, established by state, local, and tribal governments for the purpose of conducting elections. School Districts School districts are geographic entities within which state, county, or local government officials provide public educational services for the area's residents. An urbanized area consists of densely settled territory that contains 50,000 or more people. An urbanized area may contain both place and non-place territory. The U.S. Census Bureau delineates urbanized areas to provide a better separation of urban and rural territory, population, and housing in the vicinity of large places. Traffic Analysis Zones (TAZs) A traffic analysis zone is a special area delineated by state and/or local transportation officials for tabulating traffic-related data and usually consists of one or more census blocks, block groups, or census tracts.